The Public Meeting, previously reported on the Wesham Billboard, called by Medlar-with-Wesham Town Council, was held on Thursday 27th November, to hear the views of the public about a potential additional housing development in Wesham. Cllr Linda Nulty began the discussion by outlining the current situation regarding a potential application on land to the north of the Town. It was stressed that the discussion should be, at this stage, considered as 'in principle' , as no detailed plans were available. The Community Centre was packed with residents and interested parties who collectively indicated later that they did not want any more housing in Wesham. "Wesham has had more than its' fair share of housing in the Fylde"
It was reported that a developer was in discussion with Fylde Borough Council concerning land north of Mowbreck Lane. Whilst no specific plans have yet been lodged with Fylde Borough Council, it seems that there is an intention to put an application in to build around 200 houses. 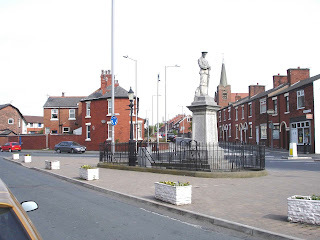 Medlar-with-Wesham Town Council, when they were made aware of the potential planning application being submitted, decided to call a public meeting to give residents an opportunity to express their views. Many arguments were put forward by the meeting protesting about the potential plans. In a show of hands the vast majority of the audience indicated they would oppose any plans. Nobody spoke in favour of the idea of having even more housing in the Town. "There are already enough houses in the town and that existing developments remained unsold"
Fears were raised the additional building would put more pressure on roads and schools, and lead to the loss of open space. "The by-pass is already really busy at rush hour and parking at the train station is inadequate. I don't think the road tructure or the railway can handle any more commuters"
"Any building would severely affect the wild life and the biological heritage site in this area". Reference was also made to the Housing Section in the recently completed Parish Plan which reinforced the views of the residents as indicated in the responses to the questionnaire issued during the year. A member of Medlar-with-Wesham Town Council, at the conclusion of the meeting said that the views expressed on the night would be taken into consideration when the Town Council prepare their response to any any plans if and when they are submitted. Any further views may be made to any Medlar-with-Wesham Town Councillor, or via the 'comments' link below. A Public Meeting will be held at 7.30pm on Thursday 27th November at Wesham Community Centre to discuss the Potential Housing Development on the land at the rear of the Fleetwood Road recreation ground. A notice has been issued to every household in Wesham together with the recently completed Parish Plan. Page 19 of the Plan (viewable by clicking here) covers a section on 'Housing' and gives a flavour of the current feelings of Wesham Residents. Also on the Agenda will be the Parish Plan itself and the way to take it forward, Kirkham Baths and the Fleetwood Rd Skateboard Park. 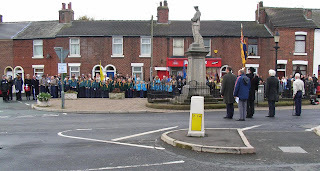 Officiated by Rev Alan Rawe, Wesham's Community attended in large numbers at the Remembrance Day Service . 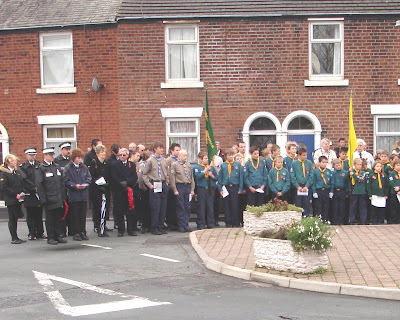 Medlar-with-Wesham Town Council; Fylde Borough Council;The Armed Forces; Christ Church Wesham;Lancashire Constabulary;St John Ambulance;The Scout Association;The Guide Association;St Joseph's Catholic Primary School;Medlar-with-Wesham C.E Primary School;Wesham and Treales Christ Churh Youth Group;Kirkham and Fylde Rural Lions; Mrs Linda Higham and Wesham Community Pride Trust. The Service was a truly Community spirited mark of respect in memory of those who sacrificed their lives for us during wars. The Remembrance Day Service has, over the years, increased in numbers attending at the Memorial. 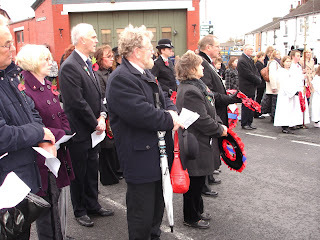 For the organisers it was particularly pleasing to see so many young people attending and laying wreaths. 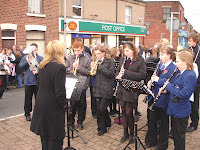 During the service hymns were sung by the congregation accompanied by Carr Hill High School Band, the last post being played by a band member prior to the minutes silence. They were our parents, our children and the friends of mine and yours. Doing what they had to, in the only way they could. They went because they had to, not to answer Britain's call. Doing what they had to in the only way they could. They were ordinary mortals, often petrified with fright. Is for those who did what they had to, in the only way they could. 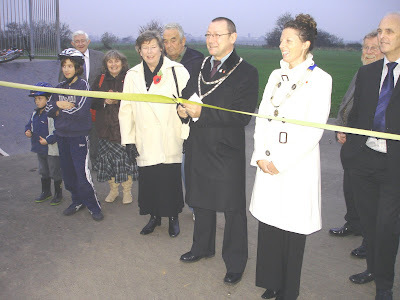 Wesham's new skateboard park has been officially opened by the Mayor of Medlar-with-Wesham , Cllr Michael Devaney. The event took place on Thursday evening (6th November 2008) attended by members of Wesham Town Council; Lancashire County Cllrs, Bernard Whittle and Liz Oades; Fylde Borough Cllr, Linda Nulty; former Chairman of Fylde Children and Young People's Group, Richard Nulty; Executive members and Officers of the Local Strategic Partnership; Fylde Borough Officers; local skateboarders and mountain bikers. Cllr Devaney paid tribute to all those involved in achieving the new facility for the youth of Wesham and Kirkham and he outlined the work and funding that had gone into the project by the Local Strategic Partnership, particularly the Play Partnership as part of the Children and Young Peoples Group, Fylde Borough Council and a small sub committee of Wesham Town Council . After the formal opening, the skateboard was put to good use by local youngsters anxious to demonstrate their skills! 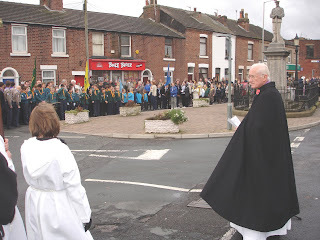 The Annual Commemoration Service will take place on Remembrance Sunday (9th November) at The Wesham War Memorial. The congregation will assemble at the War Memorial from around 10.20am to then march through the Town returning to the Memorial for the Remembrance Service. The service will be led by Rev Alan Rawe. Everyone will be most welcome to join the congregation and, if they wish, to lay a wreath.